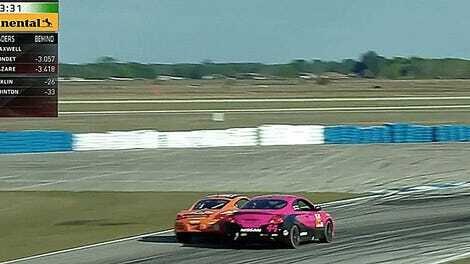 The Continental Tire Sports Car Challenge is no stranger to insanely close battles, with fairly evenly matched front-runners and only two hours to get yourself in front of the other teams. Today was no different, but one Cayman-up-Cayman-bumper battle for the lead went up to the very last corner. Spencer Pumpelly’s No. 17 RS1 Porsche Cayman spent the last half-hour-plus of today’s race tailgating the crap out of Eric Foss’s No. 56 Murillo Racing Porsche Cayman for the ST class lead. With about 14 minutes to go, the two cars bumped into each other, but Pumpelly kindly let Foss back in and the two got right back to fighting with each other—right until the last corner of the race. That’s when Pumpelly tried one last time to find his way around Foss, having to catch the back end when it tried to drift out from under his control. Both Foss and his codriver Jeff Mosing live in Texas, so it was extra cool to see them win here. Mosing in full celebration mode. With 28 minutes to go, Trent Hindman’s Porsche Cayman GT4 passed Robin Liddell in the Camaro for the lead, but then they both were passed by the No. 76 C360R McLaren 570S GT4 of Matt Plumb in one delicious feat of crazy heading up the steep hill towards Circuit of the Americas’ Turn 1. The overall winner, who had things relatively easy. Relatively. Eventually, the sister No. 77 C360R McLaren driven by Nico Rondet made his way around the Porsche and Camaro to come home in second place, with Hindman’s Porsche practically up his McLaren’s rear tailpipe. But the No. 76 had gotten a decent lead and cruised home to the win. Here’s a few more shots from today’s race. How CTSCC’s current madness isn’t the main show of the weekend, I’ll never know.